Search Results for "smart home device"
An active senior woman author writes notes in her lush garden with a nearby smart white home speaker device; she turns to ask it for information (no audio). Variation medium close up, legal pad, and white AI smart home device. Smart Home Device connecting. smart house, home automation, 4k animation. An active senior woman retiree relaxes in her garden with nearby smart home speaker device; she asks it a question and nods when she hears its response (no audio). Variation with white smart home speaker device. Smart Home Device connecting. 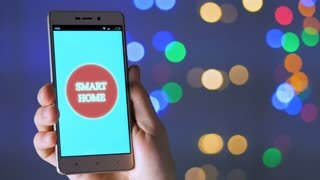 Smart House automation on smartphone, 4k animation. An active senior woman sips tea and reads a book in her lush garden with a nearby smart home assistant speaker device; she pauses to ask the device for a weather forecast (*no audio). Variation with large book and white smart home speaker AI device. Lifting smart phone, earth network connecting mobile, car, energy saving bulb, washer, refrigerator, smart home devices, Internet of things. 4k animation. Lifting touch smart pad, tablet, 'Internet of things' technology connecting mobile, car, energy saving, washer, refrigerator, smart home devices, 4k movie. Businessman slide touch smart phone, mobile, 'Artificial intelligence' technology connecting mobile, car, energy saving, washer, refrigerator, smart home devices, Internet of things. 4k movie. Businessman click smart phone, mobile, 'Internet of things' technology connecting mobile, car, energy saving, washer, refrigerator, smart home devices, 4k movie. Businessman slide smart phone, mobile, '4th industrial revolution' technology connecting mobile, car, energy saving, washer, refrigerator, smart home devices, Internet of things. 4k movie. Lifting smart phone, mobile, '4th industrial revolution' technology connecting mobile, car, energy saving, washer, refrigerator, smart home devices, Internet of things. 4k movie. Lifting touch smart phone, mobile, 'Internet of things' technology connecting mobile, car, energy saving, washer, refrigerator, smart home devices, 4k movie. Businessman slide touch smart phone, mobile, '4th industrial revolution' technology connecting mobile, car, energy saving, washer, refrigerator, smart home devices, Internet of things. 4k movie. Businessman click smart phone, earth network connecting mobile, car, energy saving bulb, washer, refrigerator, smart home devices, Internet of things. 4k animation. Businessman click smart phone, 'industrial revolution' technology connecting mobile, car, energy saving, washer, refrigerator, smart home devices, Internet of things. 4k movie. Businessman click smart phone, mobile, '4th industrial revolution' technology connecting mobile, car, energy saving, washer, refrigerator, smart home devices, Internet of things. 4k movie. Lifting smart pad, tablet, '4th industrial revolution' technology connecting mobile, car, energy saving, washer, refrigerator, smart home devices, Internet of things. 4k movie. Lifting touch smart phone, mobile, 'Artificial intelligence' technology connecting mobile, car, energy saving, washer, refrigerator, smart home devices, Internet of things. 4k movie. Businessman lifting smart phone, mobile, '4th industrial revolution' technology connecting mobile, car, energy saving, washer, refrigerator, smart home devices, Internet of things. 4k movie. Businessman click smart phone, mobile, 'IoT' technology connecting mobile, car, energy saving, washer, refrigerator, smart home devices, 4k movie. Businessman slide touch smart phone, mobile, 'IoT' technology connecting mobile, car, energy saving, washer, refrigerator, smart home devices, 4k movie. Businessman opens two palms, smart phone, 'Internet of things' connecting mobile, car, energy saving, washer, refrigerator, smart home devices, 4k movie. Businessman slide touch smart phone, 'industrial revolution' technology connecting mobile, car, energy saving, washer, refrigerator, smart home devices, Internet of things. 4k movie. Businessman touch smart phone, 'industrial revolution' technology connecting mobile, car, energy saving, washer, refrigerator, smart home devices, Internet of things. 4k movie. Businessman slide touch smart phone, mobile, 'Internet of things' technology connecting mobile, car, energy saving, washer, refrigerator, smart home devices, 4k movie. Lifting touch smart pad, tablet, 'Artificial intelligence' technology connecting mobile, car, energy saving, washer, refrigerator, smart home devices, Internet of things. 4k movie. Businessman lifting smart pad, tablet, 'Internet of things' connecting mobile, car, energy saving, washer, refrigerator, smart home devices, 4k movie. Businessman lifting smart pad, IoT technology connecting mobile, car, energy saving, washer, refrigerator, smart home devices, Internet of things. 4k movie. Businessman lifting smart phone, Artificial intelligence Brain technology connecting mobile, car, energy saving, washer, refrigerator, smart home devices, Internet of things, 4k movie. Man Getting Dressed For Work Activating Smart Home Device Via Voice Command. Businessman Using Smart Home Device While Getting Ready For Work. Asking About Daily Schedule.